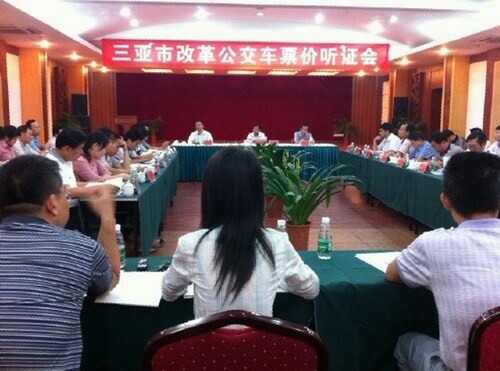 A public hearing on a bus ticket price hike in Sanya was held last Friday. 70% of the members of the panel agreed to raise the bus fare from 1 yuan to 2 yuan per person while the rest had disapproval and said they needed more time to study the proposal. Some representatives who proposed the bus fare increase said fare revenues have dropped year on year considering jumps in operational costs like oil and LNG gas prices going up and bus upgrades in recent years. To cut the losses, they proposed that the cost of taking busses to travel within the city center areas will be raised from 1 yuan to 2 yuan per person. A representative on the part of consumers for the public hearing to debate the fare hikes said 94% of residents surveyed expressed their disapproval. According to statistics, the governmental financial support on the public transportation takes up a large portion over the past three years compared to the same level of similar cities. He also added the government needs more time to study the need for a fare hike in detail and look at alternative sources of generating revenue without burdening the consumer. According to a spokesperson, the final decision will be approved by the government after all voices have been taken into consideration.